Starring: Kristen Stewart, Charlize Theron, Chris Hemsworth. Review: After Tarsem Singde's quirky Snow White film, Mirror Mirror, starring Lily Collins, Armie Hammer, Julia Roberts and Nathan Lane, British director Rupert Sanders decided to take a darker, deeper spin on the fairytale in Snow White and The Huntsman. The beginning of the film was incredibly slow, but beautiful nonetheless. It took about 20 minutes to get to the explain everything and get to the present day. The films visuals were breathtaking -- from the dark forest to the 'Sanctuary' as they call it, everything was extremely beautiful and well done. The CGI was great, also. The acting was uneven, which might have been the result of the confused script. You can tell Kristen Stewart's acting has improved n this film, but still fails to meet the standard of the rest of the cast. At times she shines, but at other times, she is still as awkward as ever and isn't really conveying the emotion needed in the scene. Chris Hemsworth is good as the Huntsman (we never get to know his real name, but I'm pretty sure it's supposed to be Eric). 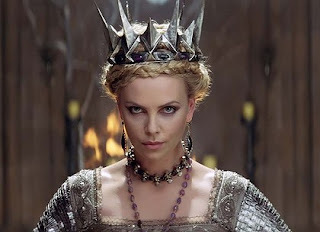 Charlize Theron is the one who steals the show as Ravenna, the evil queen. Theron's perfomance is brilliant and chilling. She remains sinister throughout the entire film, but still brings a more human side to the queen, and makes you sympathize for her. The film really picks up the pace in the second half, when the dwarves show up. Toby Jones, Ian Mcshane and Nick Frost are just some of the talented actors who play them. They bring a much needed light humor to the dark film. The film essentially leads up to one final battle at the end, but it is all over too soon and is resolved way too quickly, in my opinion. Summary: While it's beautiful to look at it, the movie is oddly paced and filled with uneven acting and script lacking subtlety. 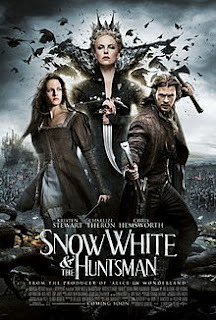 Snow White and the Huntsman is a film that a whole lot of potential, but lacked a lot of key ingredients. Worth seeing it? Yes, for the visuals, as they are stunning. But it's better to wait for the DVD. Silver Linings Playbook trailer released!